If you’re a techie person, email is essential but it’s hard to stay on top of all of it. If you use Gmail and Firefox, here’s a few tips to get email under control. The first tip is remedial: keep most mailing list emails out of your inbox. I already prune as much of my Gmail inbox email as I can. I subscribe to a bunch of mailing lists, but add filters like “If the email is to some-mailinglist, skip the inbox.” That way it doesn’t clutter my inbox (which is my to-do list), but it still gets indexed so that I can search for it later. Install Firefox and Greasemonkey. If you’re a techie, odds are you already have both of these running. Go to this page and click on the “Saved Searches” link to install a Greasemonkey script that augments Gmail with persistent searches. This script was written by Mihai Parparita, a Google engineer who actually works on Google Reader, not Gmail. To run a saved search, just click on the search you want to run in the sidebar. Click on “Edit Searches” and add a new search for the team of people you work with. 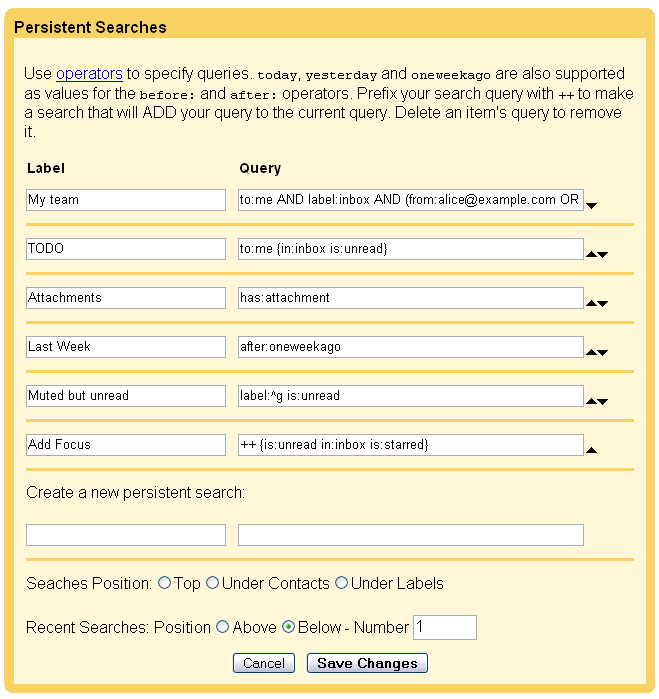 Under the text “Create a new persistent search” fill in the “Label” field with something like “My team” and in the “Query” field, add a query like the one I mentioned, then click “Save Changes.” If you want, you can move your new saved search up to the top of the priority list (the script comes with a few default searches). There are all sorts of other tricks you can do with labels and persistent searches. You could make a persistent search for different groups of people at work, or a search for email from your family. Here’s one last tip. Suppose you work at Example.com and you get a mix of email from inside Example.com and from outside. You want to exclude any outside email (that is, any email that’s not from example.com). From the inbox, click on “Create a filter”. In the From: field, enter the rule -example.com . Then click “Next Step” and create a new label called “outside” and click to create the filter. After creating the filter and label, you can do queries like “to:me AND -label:outside AND label:inbox”. Now you easily can jump back and forth between handling internal and external email. Okay, anybody else want to offer their best email/Gmail productivity tip? Can you promise Greasemonkey scripts won’t ever get anyone’s Gmail banned? > keep most mailing list emails out of your inbox. This is difficult to achieve, because GMail cannot use “envelope-to” as a filter criteria. I’d LOVE to see this feature. It would make life much easier. Greasemonkey… Greasemonkey… These scripts should be built-in Gmail, and we shouldn’t have to use a software to get these functionalities… Do you agree Matt? And Gmail Team, when will you replace the “my answer / the question / signature” for “my answer / MY SIGNATURE / the question” ???? Gmail is great, but it seems the user studies made by the team aren’t useful. I don’t fully agree with tip #1 : if I skip the inbox for a mailing-list, then I’ll never go into label or all_mail to check for intersting things… What I use is keyboard shortcuts: jxjxjjjxjxjxjy will select mails 1,2,5,6,7 and ‘yank’ then out of the inbox. I just select the ones that I know from the snippet that I don’t need to read them. If a mailing-list sends too many mails I don’t need, then I just unsubscribe, and try to find a rss feed I can plug in google reader, what I whatching on week-ends. I agree with the post above. Gmail as is, is great but there is a lot of room for improvement. It’s probably not feasible but I’d like to see naive bayesian classification of email in Gmail. However, the saving of search queries would be a great start. Better integration with calendar should also be nice, some way to implement a todo system visible on both websites? I also send emails to myself 🙂 – if I have some ideaor comment to mail which is my task I hit reply, type the details and replace the sender’s address with mine. Sometimes I am missing the possibility to easily detach the message from conversation and add them to another (or simply copy). Am I way behind the times in only just noticing the new “Add other pop3 e-mail accounts to Gmail” thing? Probably, but I still like it. The only thing that p’s me off about it is it automatically marks all the e-mails in the other pop3 account as “read”, so when I later download it using Imap on my home PC it already shows them as read. Hey, I’m probably just being picky. It definitely rocks as a new feature! Philipp Lenssen, it wouldn’t be my place to comment on Gmail’s policies about stuff like that, but I can tell you that people here love Greasemonkey. The only times I’ve seen trouble with 3rd party stuff + Gmail was when people were doing abusive stuff (e.g. a 3rd party notifier that was checking 1000 times/second for new email). Henry Elliss, that is pretty nice. It’s good to have a free, large, searchable email account that can also pull in other email (or forward email) for free. I wrote it and then didn’t have the 5% extra energy to bulletize it and make the tips stand out clearly. Oh well..
Gmail is very effective in filtering spam. Love it! Now I’d like to try the new feature of getting mail from other pop3 accounts to gmail. Will gmail apply the same spam filtering or would I see the raw spam in my gmail inbox? (I know it’s not strictly on the subject but since we’re talking gmail might throw this into the pool). If I need to go through the recipts for the accountant it’s one label, for the reciepts for example.com it’s a combination, and for all the reciepts it’s a combination. I use gmail through multiple machines at work and home i.e. several browsers and several levels of access rights and user obligations, so Greasemonkey wizardry is no good for me. I wonder if that comes out in Google’s logs – do most people login from the same machine? If so then I guess you have a number that tells you how much of MS Outlook’s mindshare you are displacing, and that probably makes you happy. But I hope you privileged types who can choose your browser and install the scripts you like will tell the gmail-prioritisers if something deserves boosting up the queue so the rest of us can benefit. Thanks in advance. I note my suggestion to implement a rot13 button in gmail hasn’t made it to the top of the priority list. This makes me doubt the process. I mean, what’s the matter – didn’t you like 1985?! What I need is the filter to let me force an item into the Spam pseudo-folder. All I need is a “Mark It SPAM” checkbox in addition to “Skip the Inbox (Archive it)” and “Delete It.” I don’t want no stinkin’ greasemonkey but will consider it if that’s the only way to do it. What do Google employees use for mail at work? Gmail or Outlook? Thank you for the Gmail tips and the introduction to Greasemonkey. I hadn’t run across that yet. I like to keep my inbox cleaned up. This will certainly help. And the “image examples” are very helpful. Thanks a bunch. I faced a lot of problems handling over 100 mails a day, many official (from many offices) and few unofficial ones. The arrival time of mails was add-on problem, now I manage it with ease. I had many labels and filters, now I do not have many (I do have few filters). I am going to use these tricks as well. http://www.idealwebtools.com/blog/100-mails/ comes out of my experience. Thanks for the great service. The best job in this world is to develop applications for yourself and google does it every time, from searches to email. Keep going, we wish you good luck. Thanks Matt, that is really helpful. Compose a new email in Gmail and then immediately click on “Edit searches”. The Persistent Search Options load in the left nav and not in right hand side of the browser as one would expect. This only happens when you are composing an email. I still wish I could click on the words “To” or “CC” to access my contacts. Gmail is almost impossible to use if I want to forward an email to 50 of the several hundred contact I have because I usually can’t remember everyone’s name. The feature where you start typing and it retrieves people’s names only works if you can remember who people are. Sure… you can assign people to groups but I have found that it’s impossible to create a group for every situation. I have lots of groups but I almost never use them. The search feature is also useless for me. My brain prefers to organize things into folders based on topics and sub topics. When I want to retrieve every email received on a broad topic, I need to do a lot of different queries. Again… The search function works better for people with a photographic memory for details versus people like me who don’t make a mental note of every trivial email I read. There should be more than one way to do something. What’s wrong with using Tags – & – Folders or using both Address suggestions – & – an easy to access List of addresses and names? The single biggest thing they could do to make Gmail much, much more useful is to use the address book information when processing messages. 1) Automatically whitelist anyone I’ve sent email to. This would largely eliminate the false positive issue with spam filter. 2) Give me one-click to see just messages from people I know. (Defined as people in my address book.) This would let me quickly scan personal email vs receipts, itineraries, etc. I currently use multiple gmail accounts to separate things, but it would be nice to have everything come into one place. The biggest productivity booster would be the identification of non-English character sets like Cyrillic or to determine if a message is written in something other than English. In my case, it’s ALWAYS spam that should be immediately shunted. I’ve recently set one of my employees up with e-mail. I have her using GMAIL to please our e-mail. Often she will reply to e-mails for me. It would be very handy if we could have multiple signature blocks. there’s one firefox addon that helps in modifying gmail look feel and functions. rcjordan, I’m not sure I understand. If you click a checkbox and then hit the ! key, that marks it as spam and ejects it from the inbox. Mitch Lomax, I use Gmail. Awesome Matt! Thank you for the great information about Gmail and the introduction of Greasemonkey. I have tried it and its working fine. Thanks for explaining step by step with image examples. Hiren Modi – SEO Specialist. 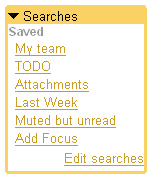 Have a look at http://www.gtdgmail.com/ , a Firefox extension that turns Gmail into a GTD application. Wow, I thought I was the only one annoyed by this. Hopefully it will be changed soon, since it seems to be such an easy thing to fix. I am considering writing a web app that would make use of gmail’s mail server ( or any mail server ) and would simply fetch/send emails . Don’t know if I’ll have to shut down if it becomes in any way popular. Excellent tips. I have noticed lately that more spam seems to be getting through gmail filters. I ONLY use my gmail account for friends and family. Are spammers starting to outsmart gmail? My important emails skip the inbox and go into the SPAM folder. How do I unSPAM that automatically? I mean everytime I receive email from that person, it goes into the SPAM folder. I’ve unmarked it as not SPAM but it still gets in the SPAM folder. Anybody knows how to fix this? can’t get the persistent searches script to run — it crashes firefox v3.0; I am also running better gmail v2 but the searches script doesn’t run even when better gmail is disabled? can you help? Sorry, it seems me a good tips, I don’t know why it is not working for me, I have installed Firefox and greasmonky script from long times and using it but your third step not working for me for new sidebar of saved searches. Greasemonkey works well. I wish Firefox didn’t need to be rebooted as much as it does.